Yesterday was an intensely challenging day for me. It started off simply enough; after enjoying a robust cup of coffee, I donned my favorite apron and did a bit of cleaning. I’m still moving into my house here and there is ten months of accumulated dust everywhere, so a little attention to sprucing up each day gives me the sense that I am making progress. Piano, piano, as they are fond of saying here in the village. My calm routine was soon interrupted by a visit from my dear friend, Antoinetta. She was bearing sad news. A mutual friend’s father had just passed away. This news shocked me, as he had not been sick at all, and just thinking about how my friend and his family must be feeling sent me into a bit of a tailspin. Antoinetta waited while I washed up and changed my clothes and together we walked up the steep cobblestone passageway to be with the family and offer our condolences. On the way we stopped to sit and chat for a bit with an elderly woman who we found sitting in front of her fireplace, unable to get out of the house without assistance. During the conversation I learned that the woman’s name was Rosina, my mother’s name, and that she was one year older than my mother would be, if she were still alive. For reasons I cannot explain, this knowledge propelled me further into my nose dive. We helped Rosina out of her house and all three of us walked slowly together toward our destination. Realizing I could not sit around feeling sorry for myself (I could actually hear my mother telling me so in my head.) I packed up my lap top and walked down to Claudia’s office space to do some work. I had plenty to do and dove right in. I’ve been giving a couple of webinar classes and had some bugs to work out with the technical people. For the next four hours I sat in the office working to clear our problems. While there, I received photos my daughters sent to me via email of the dress fitting. The dress was stunning and my daughter looked radiant in it. Finally, at 7:30 last night, I was assured that all was well. I closed my lap top and carried it back up the hill to my house. I was feeling quite exhausted, still a bit low and on top of everything, my back hurt. I made myself a simple meal of mashed potatoes, cabbage and onions, mixed a cup of aqua vino into which I placed some rose glycerite and tinctures of wild yam and rosemary, and then sat by the fire to consume my dinner. After sitting for a while I filled a hot water bottle, took it to bed, said my rosary and fell soundly asleep. At some point during the night I woke from a most wondrous dream! I was walking through our sacred mountains with my daughter Grace. The trail was narrow and treacherous, we had fear of falling, and there were little animals running under our feet. But all along the sides of the mountain were encouraging messages for us, blessings, if you will. The signs said things like “keep going, the trail will widen and level out soon, there is no need to worry, you are entirely safe. Great Mother is always with you. This way leads you directly into the heart of the Divine Feminine.” Needless to say, this dream brought me great comfort and joy. 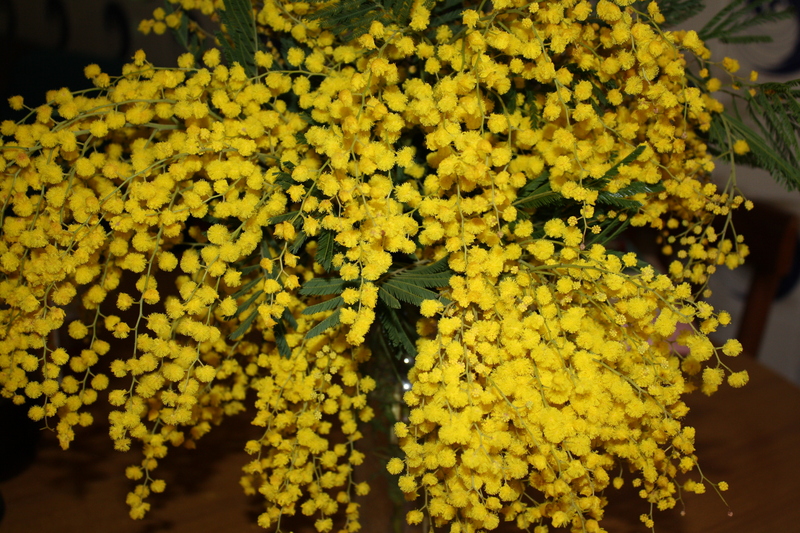 And then this morning, when I got up and went out on my balcony to see what the weather was like, as is my habit, I glanced down to see that a big, beautiful bouquet of freshly picked, bright yellow Mimosa flowers had been placed on my doorstep while I slept! My spirits soared! Today I am giving thanks for dear and precious friends and family who will go out of their way to show they care, for my beloved and amazing mother who even in death manages to send me consolation from wherever she is, and for the profound and deeply nourishing mysteries of love and life itself. This morning I truly feel held in the loving and protective embrace of Great Mother and want to share this joy with you. May your day also be blessed. Gail, I want to thank you for sharing this post. Your words touched my heart and made me think of my father and son who are both on the otherside of the veil. It is amazing how when we need to be lifted up, spirit sends us a message via your dream to lift you back you back up and set things right again in our hearts and mind. By sharing it with others spirit continues its work of getting the message to the people who need it the most. Bless you for sharing and for your wild heart. Your story brought tears to my eyes. Thank you for sharing such tender moments with Great Mother.